Sun fingers! I didn’t have my camera with me (Shame on me!) so I did my best to capture these wonderful rays of sunshine with my phone camera (sadly, my camera phone sometimes captures the shot better than I do with my real camera). I made several stops on my way into work, trying to capture it without electrical lines and water towers or buildings. I just cannot get enough of the beauty of fall. Okay, I put this off for as long as I could. What is fall without pumpkins? While I am not a fan of all the pumpkin-flavored foods, drinks and snacks that seem to take over our supermarkets, I do enjoy a good pumpkin-spice latte and of course pumpkin bread but really, I just love the pumpkins themselves. I find that wandering through the maze of different colors and types has the same calming effect that a bookstore does and my favorite place to browse…The Red Barn Farm in Weston, MO. Not only do they have an amazing show of pumpkins, gourds and squash, they offer the whole experience. Apple cider from their own orchard, hay rides, farm animals and an adorable little shop…all on a real farm. Aside from our friends and family in that area, this is one of the things I miss most about our years spent there. Do you have a favorite pumpkin patch? Let me know! If it’s in the Des Moines, Iowa area, I might just check it out. This beautiful shade of blazing yellow is a reminder to me to not waste time. Cornered by the Meredith buildings on the South and East, this little green space is one of my favorites. Surrounded by one-way streets heading east, it is a beautiful and welcoming entrance into downtown. Running along the east edge of the space is a row of trees. While they are pretty in the spring and summer and provide nice shade for those waiting at the bus stop, in the fall is when they really come to life as they turn this wonderful warm color that captures the sunlight in an amazing way. The only drawback is that once they turn, your opportunity to catch that aura while still on the trees is short lived. I’ve been watching and waiting for the perfect time, hoping to capture it at just the right moment. Having made the choice to spend time at home over the weekend, I was hopeful as I approached the area Monday morning, on my way to work. Rounding the curve of Grand Avenue and approaching the stop light just in front of Meredith, I saw it. Rich, golden, and capturing the morning sunshine perfectly. I even hesitated for a moment, thinking I should just stop and try to get a shot with my phone. The trees were perfect and even better, the sidewalk was covered in a carpet of yellow. Regrettably, I did not stop. Reasoning that I wanted to walk down over my lunch when I wouldn’t have to rush. At 2:00pm, late for my lunch and knowing that I had to be back by 2:30pm for an afternoon team meeting, I rushed out the door and headed west. The breeze had picked up since the morning so I was already concerned that I had missed my chance. As I got closer I became even more disappointed. 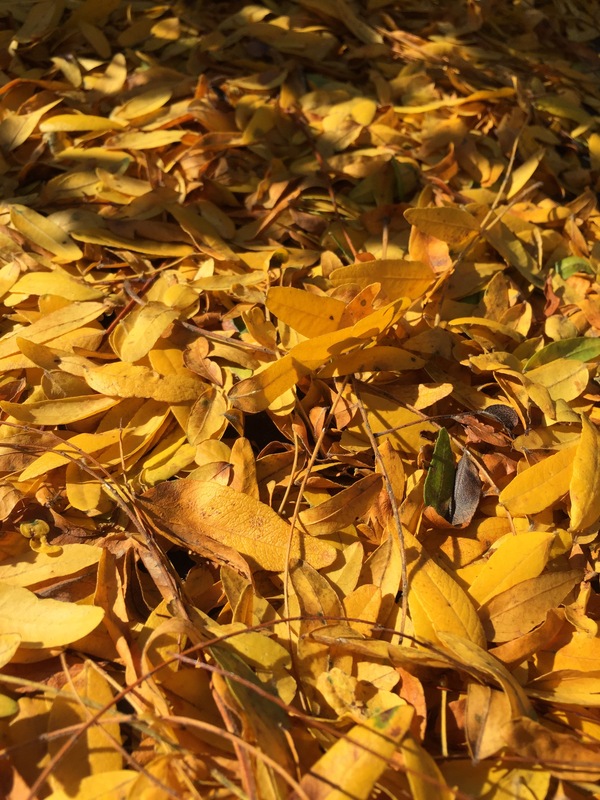 The sidewalks had been covered with the richness of fall that morning but most of the leaves were now blown up into piles on the edges of the lawn and curbs. When I was within eyesight of the trees I was headed for, my heart sank. The breeze had blown the tops almost clean of leaves and the leaves themselves were scattered onto the grass or in small piles like this one along the edge of a flower bed. It only takes a blink…don’t let those perfect moments pass you by. Capture them when you see them. “Perfect moment” is only perfect for the moment before they are gone with the breeze.